Remember the easiest homebrew recipe I published a while back? It turned out okay but not great. Drinkable but not exciting. 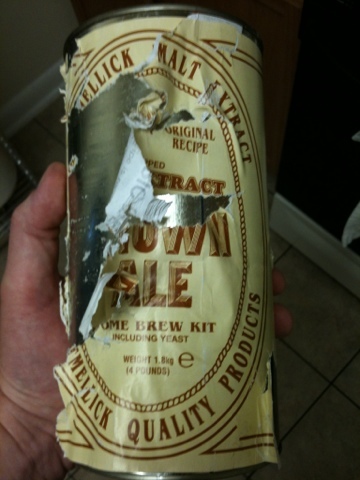 I was at the homebrew shop not too long ago and saw a can of Mountmellick Brown Ale. Similar story here – pour the syrup in a sanitized fermenter, online add a kilo of dry malt extract, and add boiling water. Bada bing, bada boom, you have wort to ferment. It was only $20. How could I go wrong, I wondered. 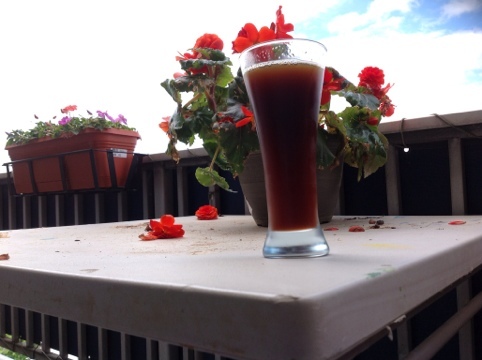 I just kegged and force-carbonated the brown ale this past weekend and it turned out surprisingly well. It is smooth, has a pleasant mouthfeel, and does not have a lot of hoppy bitterness. Very nice indeed. The hops could be a bit more, but overall it is fine as-is. I highly recommend doing this if you want a basic brown ale to sip while your more complex brews are bubbling away. There's a problem with this product, though. Note the condition of the can at left. The recipe for the beer, not that there is much of a recipe, is on the back of the label. I tried cutting along the "cut here" line, but found that the entire label was glued on, or at least appeared to be, around the whole of the can, not just where the label overlapped itself. I soaked the can in soapy water for quite a long time but the glue never released its hold on the label, and when I tried to gently peel it, the paper more or less disintegrated. The label never really came off, certainly not in one piece, so I did not get to read the directions. Oh well. Two days before making the beer, I made a yeast starter with the little packet of yeast. I will write more about this later. In this case, it was mostly because I do not trust those little packets that come with these kits. Making a starter is the best way to ensure the yeast are, in fact, alive, and help them prosper. Pour the syrup and DME into a sanitized fermenter and boiled two gallons of water in your brew pot. Pour the boiling water into the fermenter and mix it until the DME lumps are all out of the mixture. Be sure to splash a lot to get oxygen back into the liquid you just boiled. Fill the fermenter the rest of the way with water, let it cool to room temperature, and pour in your yeast slurry. A best practice would be to let it ferment for a week or two, then transfer it to a secondary fermenter for clarifying. I skipped the secondary fermentation and kegged it after two weeks in the primary. It turned out fine. Again, highly recommend this beer if you want something quick and easy. maybe this is not an issue for you. However, if you have multiple kegs and a kegerator and sometimes take your beer to parties or homebrew club meetings, this becomes a more serious issue. Different people have different processes, but this one is mine. 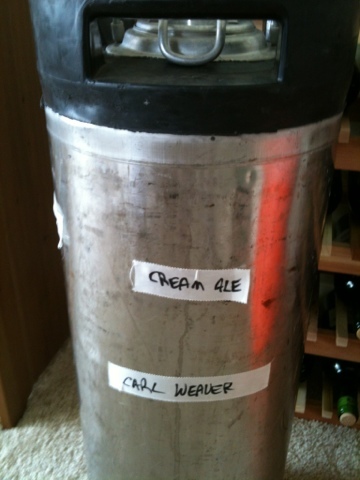 For simple identification, I label each Corny keg on the front with its contents, as well as my name. The contents label makes it easy to identify, obviously, and the name label is handy for when I go to my homebrewing club, where we have at present four guys who keg their beer. It just ensures that I go home with the same equipment I arrived with. These two labels go on the front. I defined the front as being the side facing you when the input side is on the left and the output on the right. I read once that the proper way to install the lid of the keg is to have the lever pointing toward you when the carbon dioxide hookup is on the left, so in my mind I decided that was the front of the keg. It was arbitrary, I admit, but it established a standard for how to do this. 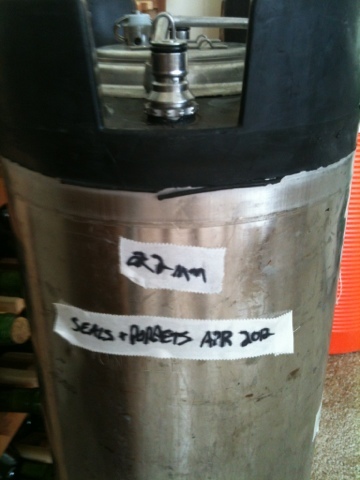 I also make some markings on the gas side of the keg. One piece of tape shows the size of the fitting. 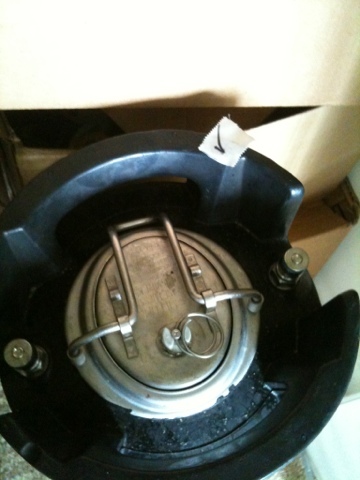 Ball lock Cornelius kegs typically have one of two fittings, either 11/16" or 22mm. Being able to see this readily allows me to grab the right tools the first time without having to mess around too much trying to figure it out. This is where the pin lock kegs have an advantage: one tool to take any of them apart. Granted, it is a specialty tool, but there is only one size. The other marking on the side of the keg tells me the date I last rebuilt or serviced the keg. I have been on a kick to replace poppets in all my kegs because I have had some recent failures, so I label when I replace both the seals and the poppets. If I were really organized I would keep a spreadsheet of this information to establish a proper maintenance schedule, but I don't guess it's really that important. I only have seven kegs, one of which I have not rebuilt or even used yet. This is not a big operation I am running here. Finally, I try to keep my kegs as clean as possible, and often have a keg or two cleaned, sanitized, and sitting in the closet. To designate which homebrew kegs are ready for use, I put a piece of tape with a check mark on top to denote that it is ready for use. Again, this is just a quick visual cue that tells me whether a piece of equipment is in good order. I can just grab it and go. The materials I use for this labeling are pretty simple. A Sharpie pen and a roll of the cheapest cloth medical tape I can find do the trick nicely. The cloth tape is pretty rugged and holds on well even through washing the outside of the keg. It also peels off easily, should I want to change the labels at any point. Whatever method you use, you might find it useful to start labeling your kegs and establishing this set of good habits so you know whether your equipment is ready to use or not. Do you have a method for this? Let us know. was that the dark beer didn't travel well. Luckily for the Russians, the British had experienced this problem before, in shipping ale to quench the growing British population in India. The British discovered that in order to allow ale to survive the long journey to India, the solution was to increase the preservative qualities of the alcohol and hop content of the ale, thus creating the Indian Pale Ale style. The British applied this same technique to satisfy the growing Stout fan base in Russia. The result was a thicker, hoppier, more potent style of Stout referred to as Imperial Stout, or Russian Stout. In general, Stouts (particularly Dry Stouts) possess dark color and a light body with low alcohol content and hop presence. To help the Stout endure the voyage from London to Moscow, British brewers capitalized on the bacteria-killing characteristics of alcohol and hops. To achieve this, the quantities of malt and hops were increased from the standard Stout recipe to raise the amount of fermentable sugars and hop presence in the final product. The Alcohol By Volume (ABV) of Imperial Stouts can range between 8% and 12% as compared to 4% to 5% ABV of the average Dry Stout. The increased specific gravity from the additional malt gives the Imperial Stout a thicker mouthfeel. Hop flavor and aroma, which is often barely detectable in Dry Stouts, has a relatively high presence in an Imperial Stout. Imperial Stouts are essentially Dry Stouts with an increased specific gravity and more hops. Similar to Dry Stout brewing, when creating your own batch of Imperial Stout from extract it is best to use light malt extract and focus on the specialty grains to give the brew its dark color and roasty flavor. Use around nine pounds of malt extract as the base. This increase in fermentable sugars will yield the higher ABV percentage. The specialty grains are similar to those used other Stout varieties such as the dark varieties of crystal and caramel malt, chocolate malt, roasted barley, and black malt. These specialty grains will produce a nice opaque, dark color and add roasty flavor. The use of hops in Imperial Stouts requires some consideration due to the style's high specific gravity. A high specific gravity inhibits the ability of the wort to absorb the bittering, flavoring, and aroma characteristics of the hops. What this means is a lot of hops are needed to achieve the right level of bitterness and flavor. The amount of hops in a typical Imperial Stout recipe often exceeds the amount needed for an American IPA recipe, and the American IPA is a very hop-filled style of ale. Three or four ounces of hops with a high Alpha content (10 to 14 AAU), such as Chinook, Nugget, or Eroica, will work as bittering hops. Two ounces of hop varieties with lower Alpha content (4 to 8 AAU), such as Cascade, Fuggles, Kent Goldings or Mount Hood can work well as flavoring hops when added with 30 minutes left in the boil, and the same amount and varieties can be added as finishing hops in the last ten minutes of the boil. One of the desired outcomes when making an Imperial Stout is a high ABV percentage. For this reason, I (Andy) recommend bypassing the use of Ale yeast and pitching one to two packets of dried champagne yeast. Champagne yeast tends to operate better in higher alcohol environments and may help avoid some undesirable flavors resulting from "stressed" yeast. Carl recommends another method: make a large yeast starter using regular high-gravity ale yeast, such as Wyeast British Ale #1098 or White Labs WLP007 Dry English Ale. Carl is working on a post on this topic now. Allowing a little extra fermentation time than the average Stout style is also a good idea. A primary fermentation of 14 days and a secondary fermentation for about a month will yield good results. Here is a basic Imperial Stout homebrew recipe for a five-gallon batch size. You can get these ingredients at any homebrew store. Substitute specialty grain and hops varieties and quantities to meet your taste. Silver City Barrel-aged Imperial Stout by NorthwestBeerGuide. hey this recipe looks great! Any idea what the target OG is on this?